This week we have a new release from author Lauren Oliver. This book is stated to be an engrossing psychological thriller! I can not wait to check it out! About the Author: Lauren Oliver captivated readers with her first novel, the New York Times bestseller Before I Fall, a Publishers Weekly Best Book of the Year. She followed that up with Delirium, the first book in her New York Times bestselling trilogy, which continued with Pandemonium. 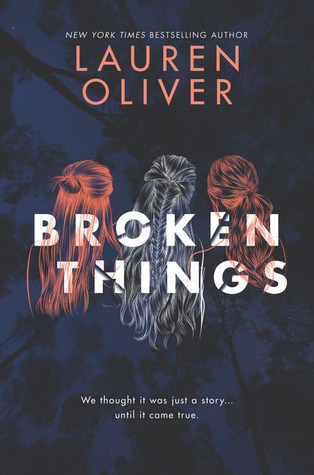 Oliver is also the author of Liesl & Po, a book for middle-grade readers, which received three starred reviews and was described as ""a gorgeous story--timeless and magical"" by Newbery Medal winner Rebecca Stead. A graduate of the University of Chicago and NYU's MFA program, Oliver lives in Brooklyn, New York. Before we were the Monsters of Brickhouse Lane-before everyone from Connecticut to California knew us by that tagline, and blogs ran pictures of our faces, and searching our names led to sites that crashed from all the traffic-we were just girls, and there were only two of us. Five years ago, when I had just turned thirteen, I killed my best friend. I chased her down and cracked her over the head with a rock. Then I dragged her body out of the woods and into a field and arranged it in the center of a circle of stones I’d placed there with my other friend, Mia. Then we knifed her twice in the throat, and five times in the chest. Mia was planning to douse her body with gasoline and light her on fire, but something went wrong and we bolted instead. Here’s how everyone knew we were guilty: we had described the crime, more or less, in a fan fix sequel to the book we were all obsessed with, The Way into Lovelorn. Afterward, Mia and I split up. She went home and spent the evening conked out in from to the TV, without even bothering to clean the gasoline that had soaked her jean shorts. I was more careful.